Random House has revealed the cover to the new Bond book. It looks, if I’m not mistaken, very much like this. I like that. Kind of minimal, understated. Droplets, or bullet holes, and the merest hint of the legendary 007 designation. The book itself is set in 1969, so it marks a return to period Bond, which is where the character really belongs, I think. Shades of Licence To Kill, then. That movie was originally going to be called Licence Revoked, but the name was changed because it sounded too much like Bond had dropped points on his driving licence. There’s a faint echo of Ian Fleming here, of course. The Bond creator was involved in the genesis of the Man From Uncle TV series. His only lasting contribution was the name of the hero, Napoleon Solo – surely as cool a name as has ever been invented. Boyd’s participation is another prestigious notch in the bedpost of the Bond brand. Kingsley Amis, writing as Robert Markham, wrote the first post-Fleming novel, Colonel Sun, in 1968. John Gardner and Raymond Benson both wrote a series of novels which updated 007.. Since then, Sebastian Faulks – his effort was also set in the 1960s – and Jeffrey Deaver have both been given, heh, carte blanche, to reinterpret the iconic character. Boyd is the latest in what seems to be an ongoing project to align the character with critically-acclaimed authors who fancy a brief flirtation with arguably the most famous character of the 20th Century. 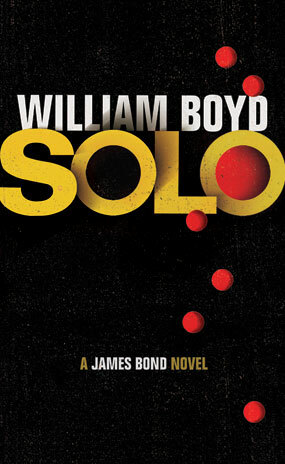 That’s the cover, then, but you’ll have to wait till September 26th for Solo to be published. This entry was posted in Books and tagged Colonel Sun, Ian Fleming, James Bond, Jeffrey Deaver, John Gardner, Kingsley Amis, Licence Revoked, Licence To Kill, Napoleon Solo, Raymond Benson, Robert Markham, Sebastian Faulks, Solo on August 5, 2013 by Crime Thriller Fella.